Although many of Harry Ornest’s holdings and interests were located out-of-state, he was nonetheless a key insider in the sports dealings of Southern California. 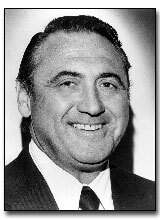 A successful Canadian businessman, Ornest took root in Beverly Hills in the early sixties, soon becoming managing partner of the San Diego Sports Arena in 1971. In 1978, he founded the Vancouver Canadians Baseball Club of the Pacific Coast League, returning Triple A professional baseball to Vancouver. The immediate success of the Canadians and Ornest’s influence were major elements that keyed the development of Vancouver’s 60,000 seat domed stadium. He sold the team in 1981. In 1983, Ornest purchased the National Hockey League’s St. Louis Blues team and the arena they played, the St. Louis Arena, realizing a life-long ambition to own a NHL club. Although he owned the team and arena for only three seasons, his ’83 purchase saved NHL hockey in St. Louis. In 1988, Harry purchased the Toronto Argonauts of the Canadian Football League. He sold the team three years later to a consortium including L.A. Kings owner Bruce McNall, hockey superstar Wayne Gretzky, and actor John Candy. The second of four sons born to Eastern European immigrants in Edmonton, Canada, Harry started working at age six delivering newspapers and selling programs at the Edmonton Arena. In 1942, he signed to play baseball with the Seattle Rainiers of the Pacific Coast League, playing second base for their Tacoma farm club. Following his discharge from the Royal Canadian Air Force in 1945, he joined Albany in the Double A Eastern League. When an arm injury abruptly ended his playing career, Harry turned to minor league umpiring. He became a referee in the U.S. Hockey league in 1946, eventually moving on to officiate in the American and National Hockey Leagues. The St. Louis Arena, which he would purchase decades later, was one of the hockey venues in which he had officiated. Harry Ornest’s family is no stranger to sports. Son Mike played in the Baltimore Orioles and Seattle Mariners organizations. Son Maury played in the Milwaukee Brewers organization. Daughter Laura was a sportscaster with the Canadian Broadcasting Company and is currently a reporter for L.A.’s KNX radio. Daughter Cindy was vice-president of the St. Louis Blues and St. Louis Arena. And, wife and life partner Ruth was vice-chairman of the Blues Executive Board.